We are experiencing a thaw at the moment but so far this has been a winter of snow. This month's project is an accordion book with snowflakes. I first made a book with snowflakes made from the metal bases of tea light candles (this recycle, reuse, repurpose thing has really got me thinking). I made a second one with paper snowflakes which is more appropriate for children. The links lead you to information about how snowflakes are formed as well as some fun online and by hand activities. For the top book, I used the side panel of a large cereal box for the accordion. Because it was sturdy, I didn't make covers. I made a snowflake from a tea light base for each page. I attached the snowflakes to squares cut from a leftover gift box by poking holes in the squares with a push pin and using thin wire to hold the snowflakes in place. I used tape that held various parts of a new printer in place to attach the mounted snowflakes to the accordion. For the second book, I used the front panel of a cereal box and made the snowflakes out of paper. For a longer book, you can follow the directions for attaching sections in the directions for the Index Card Accordion. 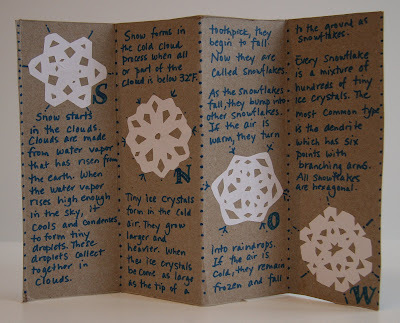 You can make two snowflakes for a four page accordion book. A comprehensive site from Kenneth G. Libbrecht who has created several books of photographs of snow crystals. Lots of beautiful images to view as well as clear scientific information. Make your own snowflake online. It took me a minute to understand how the scissors worked but once I did, it was fun. Vermont farmer Wilson Bentley made the first photographs of snowflakes in 1885. This website is maintained by the Jericho Historical Society which has an exhibit of his photographs. He is the subject of a wonderful book by Jacqueline Briggs Martin and Mary Azarian. Grace Lin wrote Robert's Snow to cheer up husband Robert after he was diagnosed with cancer and could not enjoy the winter weather. After Robert's subsequent relapse, Grace turned to her illustrator friends and asked them to contribute their collective talents to the fight. The response was tremendous--the artwork created was so amazing that the 2004 snowflakes were immortalized in the book, Robert's Snowflakes. There is an annual fundraiser for the Dana-Farber Cancer Institute every year in December.